N orth Castle has always been proud to have its main focus on fanworks. 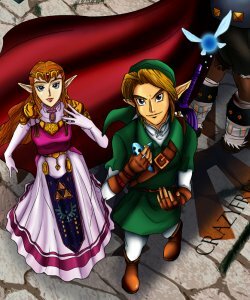 I've worked hard over the years to build up an excellent collection of fanworks for other Zelda fans to enjoy. Also I feel it gives people a sense of achievement and pride to showcase their work to the rest of the community. Without fanworks, Zelda would be a very boring community indeed. It's time that the people who make the online world of Zelda so interesting were given a handshake. This special section sets out to highlight some of those contributors. It contains a biography of the fan, links to their work and a small interview that highlights why they love Zelda and what their inspirations are, plus why they chose to showcase their work here at North Castle. I want to build this up to a definite guide as to some of the best contributors in their community, to promote their work and let people know a little bit behind the people who provide such wonderful, creative work to us, the fans. At the moment I WILL be handpicking the people I want to promote, however if you'd like to be featured then send me an email saying why, or you can also nominate someone if you think they deserve a turn in the spotlight. A prerequisite however, is that you/nominee MUST have submitted work to North Castle.